Red White and Blue clearance! Some of you may have heard about our Red White and Blue clearance sale but I wanted to introduce it to those of you who haven't and clarify to some others. The thing that we love to do more than anything else is to save you money! You have seen that we have 20% off storewide sales every month and sometimes even more than that. We also like to clearance merchandise and move it off the shelf. We have designed the Red White and Blue program to have a constant clearance throughout the store for you. The program is simple. We have gone through the store, and the manager continues to go through the store daily, to find items for clearance. 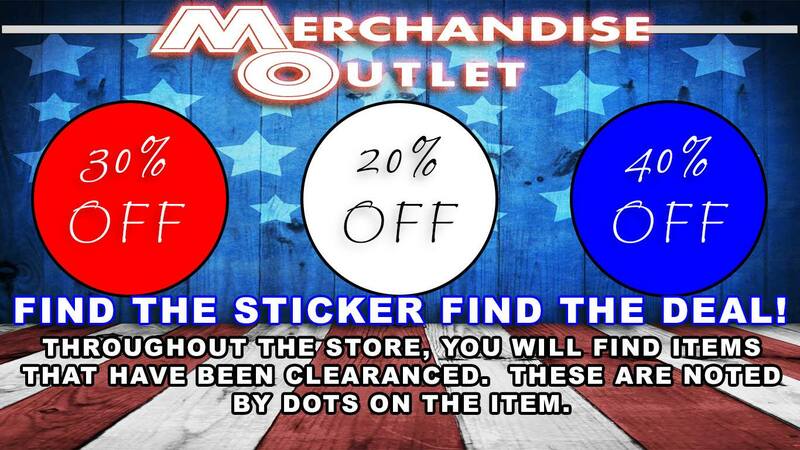 We simply put a red, white, or blue circle sticker on the front of the item. If it has a white sticker on it - you get 20% off that item; if it has a red sticker on it - you get 30% off that item; and if it has a blue sticker on it - you get 40% off that item. We buy a lot of our merchandise in liquidation form. This means that a lot of our merchandise has already been retailed or offered to retailers before it came to us. We are the end of the proverbial food chain. We can usually get some pretty good prices in comparison to retail so that we can offer it to our customers for a pretty good price. Of course, since we buy liquidation, we don't always pick the things that we buy - it all just comes in a load together with everything else. If you have been in a Merchandise Outlet, you can recognize the fact that we receive miscellaneous merchandise every day. We can get some pretty random stuff in many departments. It makes things interesting, but it makes our job challenging. We like things to look organized and have a rhyme or reason on the shelves. These kinds of things just put a monkey wrench in our organizational plan! To try to move these off the shelf, we'll put them on clearance. It might be because there are just single items, or maybe the packaging has been damaged and it doesn't look as nice as we would like even though the product is fine. These are very likely to receive a sticker. Looking for the dots is like looking for treasure. Merchandise Outlet is full of treasure!